All driver's must be 19 years or older with a full valid driver's license to drive. 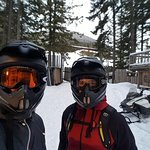 Two people sharing one snowmobile. 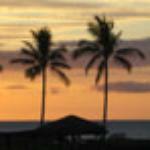 All driver's must be 19 years or older with a full valid driver's license from their country of residence. Passengers must be 10 years or older. 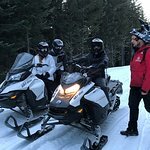 Dine in a rustic cabin far from the bustle of Whistler Village on an evening snowmobile tour through British Columbia's backcountry. A guide ensures you don’t get lost after the sun sets, and points out mountain views that many visitors never have the chance to see. On arrival at the cabin, enjoy a local interpretation of a traditional fondue dinner, paired with wine, dessert, and live entertainment. 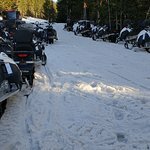 Board your snowmobile at Carleton Lodge in Whistler Village. Your destination is a rustic log cabin perched at 6,000 feet atop Blackcomb Mountain. Over the course of the evening, enjoy live entertainment as you tuck into a 2-course fondue dinner paired with wine. Following dessert, savor panoramic views of the Coastal Mountain Range and see the glimmering lights of Whistler Village from a new perspective. On your descent back into the valley, admire secluded natural landscapes that most visitors never have the chance to see. Your tour ends on arrival at Carleton Lodge. Had the most amazing time! Danny and Chantelle were our guides and couldn't ask for better people. They were so patient and informative. 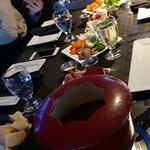 Crystal Hut Cheese Fondue was delicious! Night tour is the best. 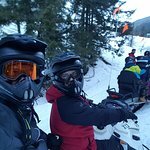 We had a great night of snowmobiling and eating at the Crystal Hut up top the mountain. Our guide Kyle was really great and helpful. Would recommend this to anyone looking for a great adventure outdoors. 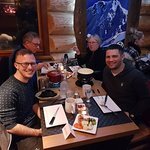 Get quick answers from Crystal Hut Fondue by Snowmobile staff and past visitors. My wife has allergies with dairy products, she can only eat fish. Is there some sort of fish for her to ea? I doubt it. They offer you: Meat fondue And cheese fondue At the end they give you q pie with wip cream And during the meal unlimited hot chocolate or you may buy drinks. But you can call them or visit them at the Carlton lodge perhaps they can do something special.